A: My name is Annabel Hagen, I’m a senior at Jackson Hole High School. I spend most of my time training for nordic ski races and the soccer season, though somehow I find plenty of time to binge-watch Greys Anatomy reruns. I have been going to Wright Training between seasons on and off since middle school and I’m been super stoked to get back in the gym this year! Q: What brought you to Wright Training? 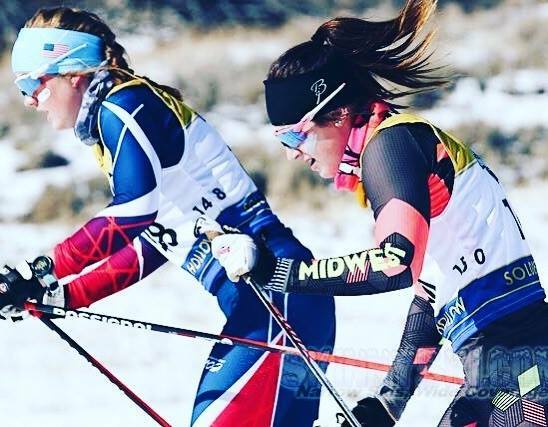 A: My injury kept me from training with my ski team this fall and, thankfully, Wright Training welcomed me with open arms! Q: How were you injured and how has that impacted your life? A: Unfortunately, I don’t have a cool story… In June, I slipped in a parking lot and destroyed the cartilage in my knee and tore my MPFL, It definitely came with a few setbacks: not getting to go ski in Canada or get on snow early season. I think the impact it’s had on my life has not been all negative. I was able to pick up a summer internship and get creative with training plans at the gym. It’s been an interesting eight months to say the least but I think I have more good things to say than bad! Q: During your rehabilitation training, what is your focus? A: My training focus is ultimately to get back to skiing and hopefully be able to play soccer this spring. More specifically, my focus has been to keep my fitness up and try to regain strength in my surgical leg. I never realized how much your body compensates by using other muscles until now, pretty crazy how that all works. Q: How has training at Wright Training impacted your recovery? A: I would be nowhere without Wright Training. I spent four days a week in the gym over the summer trying to stay sane and strong. Being able to have a place to go that was so accommodating during my injury was crucial. Going to the gym obviously helps physical strength but without the gym I think I would have lost my mind. Crystal always reiterates that going to the gym helps much more than physical strength and I 100% agree. Q: What advice would you offer to injured athletes trying to get back on their game? A: I think the biggest thing that I’ve noticed over the process is that, yes, you do miss out on a lot but there is also so much to gain and it goes by so fast if you can keep yourself busy. I remember crutching around the gym watching other athletes on the bikes dreaming about the day I could do that and now I’m there! If I had to narrow it down, the three most important things for injured athletes to realize are that injuries are not the end of the world, though you can’t follow your normal training plan there are so many other ways to stay in shape, and being able to keep a positive mental attitude is a game changer. Q: What advice would you offer teens about working out? A: I would tell teens that getting a solid workout in before going home definitely makes doing homework more tolerable. It breaks up the day in a way that there is time to space out and not think about school or any other stressors. Getting to the gym is the hardest part but once you’re there it’s totally worth it.